Well? Are you ready? Are you sitting down? Because this is a fantastic cover for a fantastic book. Titan Magic: Body and Soul follows Lamm’s 2011 masterpiece, Titan Magic, which I reviewed a while ago. And Lamm has outdone herself. Trust me, I know – I had the honor of prereading this one, and it’s beautiful. It does follow Titan Magic, though, so you really need to pick up a copy of that one ASAP, the better to enjoy Body and Soul THE MOMENT IT COMES OUT (on 13 December, according to its Goodreads page). Titan Magic (which also has a pretty fabulous cover) can be picked up in paperback or digital from Amazon or Barnes & Noble, and digitally from Kobo. Designed by Abigail Larson for Jodi Lamm’s upcoming release, Titan Magic: Body and Soul, I don’t think I’ve ever seen a cover that fits the story more perfectly. Tagged body and soul, book recommendation, cover reveal, folklore, golem, high fantasy, jodi lamm, titan magic. Bookmark the permalink. 2 Responses to Cover Reveal! 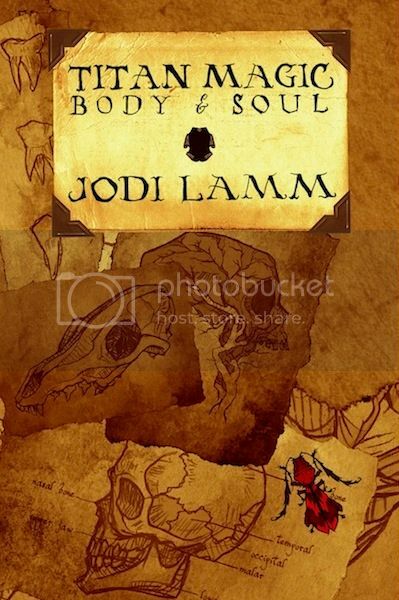 Titan Magic: Body and Soul, by Jodi Lamm! Ohhhh, sounds likes my kind of books! I’ll have to check them both out. Thanks for the recommendation.